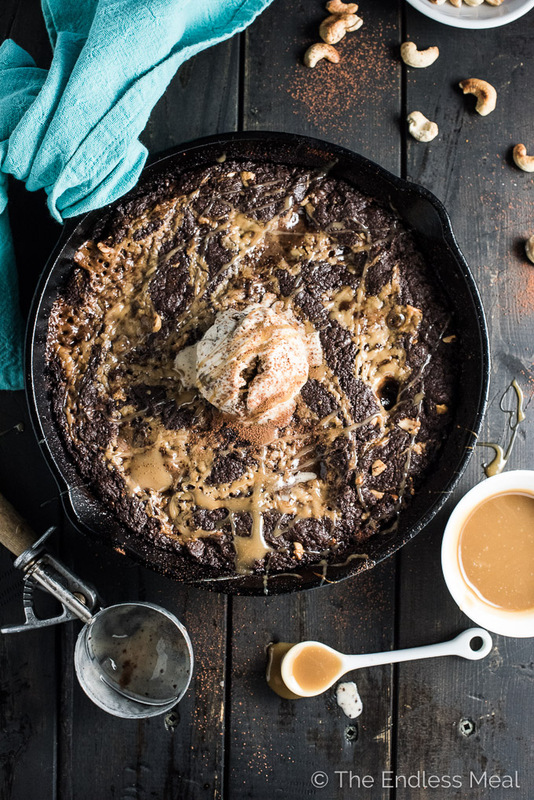 This rich and fudgy Vegan Skillet Brownie is layered with an easy to make vegan salted caramel and dotted with cashews. 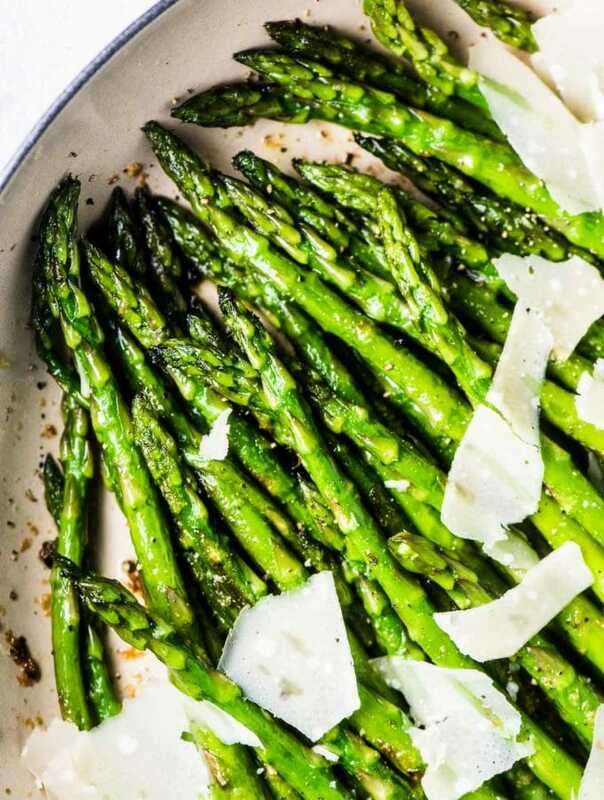 There's a secret ingredient in here that makes them extra delicious. Um, haallo. Yes, I'm talking to you, you sweet delicious thing of my dreams. I see you staring at me, all chocolatey and covered in drippy salted caramel. 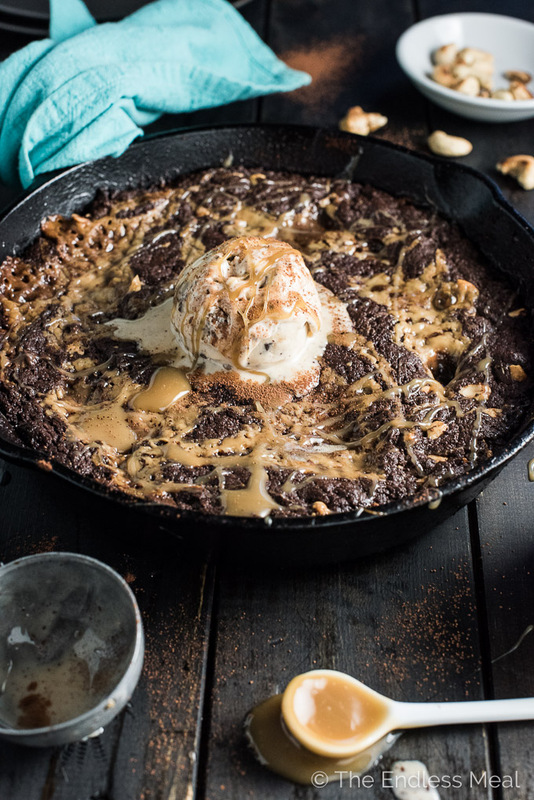 I'd be lying to you if I told you I had any power to resist this Vegan Skillet Brownie/ vegan caramel/ cashew salted caramel cluster situation going on here. It tasted (notice the past tense) even better in real life than looks in the pictures. It was ridiculous, in the best possible way. 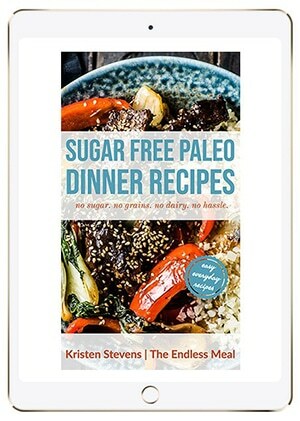 Sometimes this whole food blogger thing that I do is (almost) too awesome. I love when get to work with a brand that I totally dig … like, grab a spoon and dig right in. Insert girly squeal and happy dance. I do love all the brands I work with (I team up with awesome brands so that I can share them with you in the hopes that you'll fall in love with them, too) but some are just over the top. 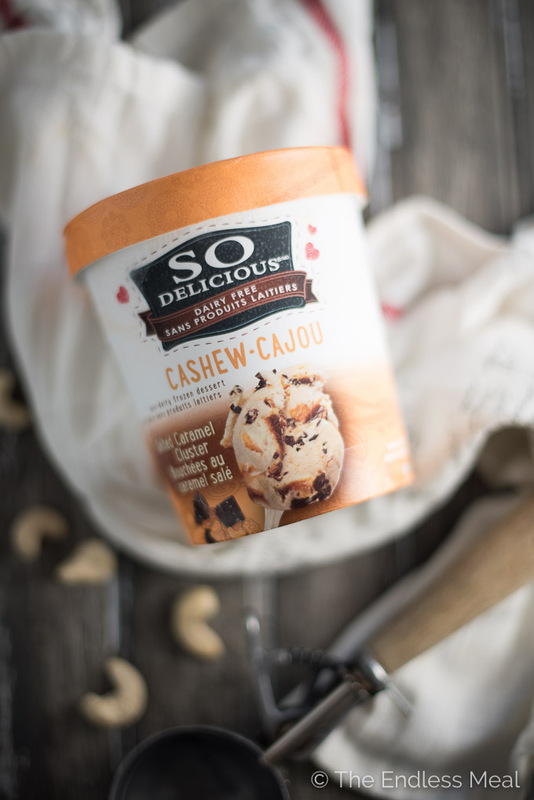 Like when I get approached by So Delicious to create a decadent vegan dessert to go with their cashewmilk frozen dessert. Seriously, pinch me. 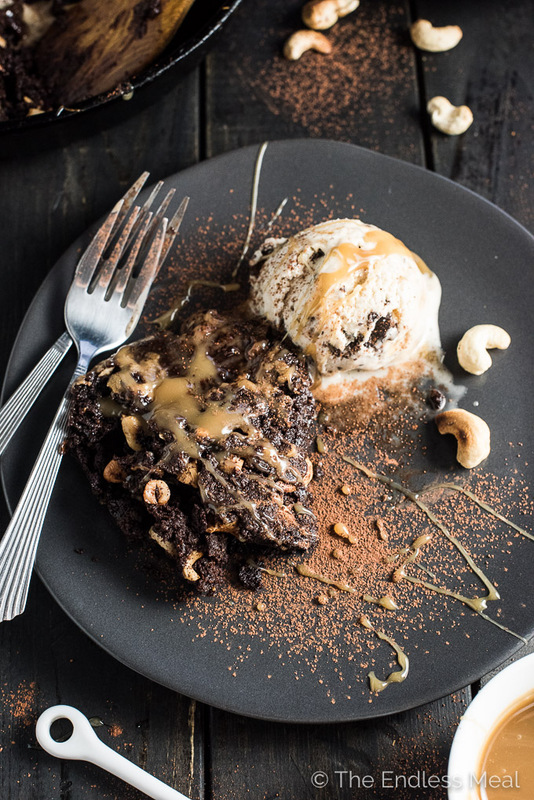 You guys, this vegan skillet brownie is off the charts. It's crazy rich and fudgy with crispy edges and sweet salted caramel. 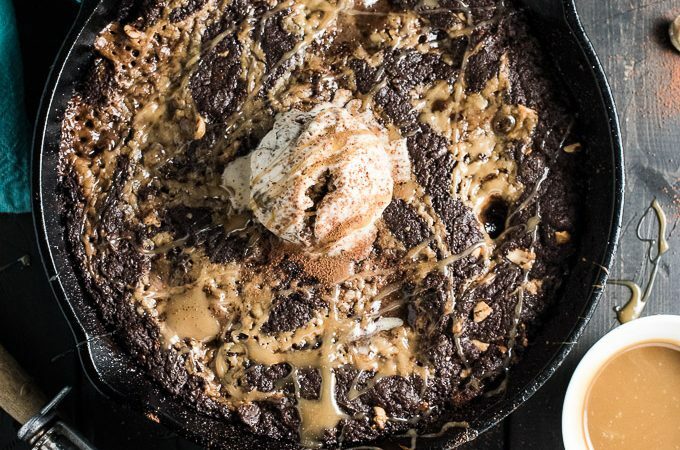 Heaven in a skillet. ? The secret to their deliciousness is some Salted Caramel Cluster nice cream. I've melted it and used it in place of milk which gives the brownies their sweetness and caramel flavor. Don't worry, all So Delicious frozen desserts are non-GMO, certified vegan, soy-free, and gluten-free. 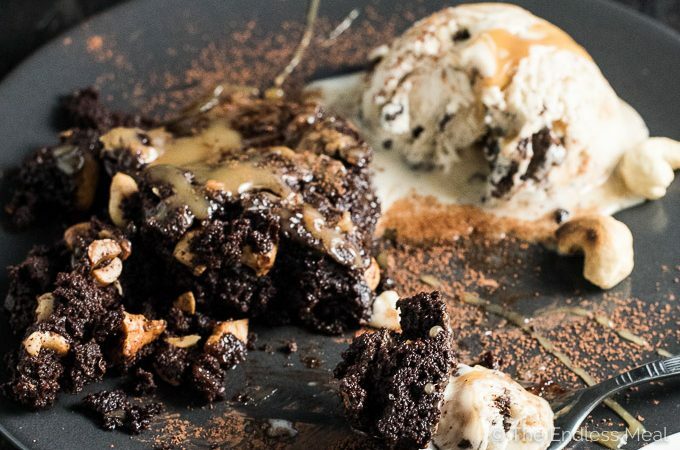 Not that it needs to be said, but you definitely don't need to be vegan to fall in love with this brownie. When I told my handsome man I was making this, his response was, “But does it HAVE to be vegan? What's wrong with butter and eggs?” Ha! Preheat your oven to 350 degrees. Grease (with coconut oil) and flour a 9″ skillet. Heat the coconut cream and brown sugar in a medium-sized pot over medium-high heat. Bring the pot to a boil then reduce the heat. You want it to continue to boil, but not boil over. Let the caramel boil for 5 minutes, without stirring, then remove it from the heat. While the caramel is cooking, start the brownies. 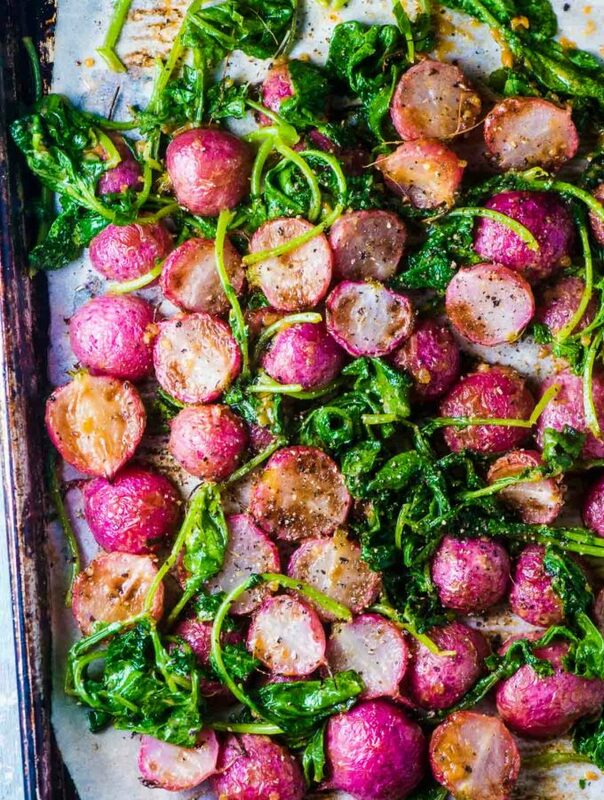 Place the So Delicious in a large bowl and set it aside. Melt the coconut oil in a small pan over medium heat. Add the chocolate chips and whisk until melted. Pour into the bowl with the So Delicious, add 1/4 cup water, and whisk to combine. In a medium sized bowl, whisk the flour, cocoa powder, baking powder, and sea salt. Pour into the large bowl and stir into the batter. Fold in the cashews. Spread half the batter in the prepared skillet. Cover with 1/3 of the caramel sauce then top the caramel with the remaining batter. The batter is quite thick so you will need to spread it out. Place 6 dollops of the caramel sauce on the top then take a knife and run it through the caramel and batter to create swirls. Bake in the preheated oven for 25-30 minutes, or until the brownies are just barely cooked through. Let the brownies cool for 10 minutes before you cut into them and serve with some So Delicious on the side. Avoid using boxed table salt in the caramel as it will give it a strong metallic flavor. 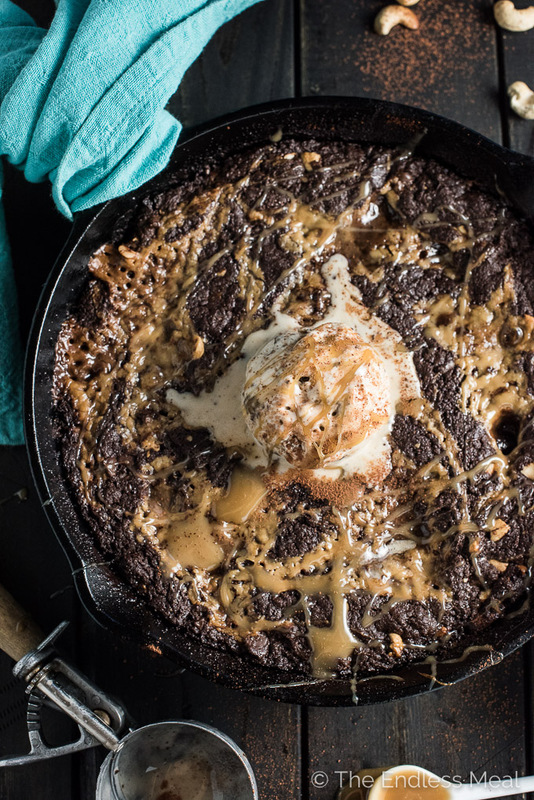 O girl, I’ve always wanted to make a decadent skillet brownie!!! It will have to wait until I go home for break though….I didn’t bring my heavy cast iron to school with me! Argh!